FOUR months after community leader Bazooka Radebe was gunned down in front of his son, an Australian mining company says it is bailing out from its plan to mine one of the world’s biggest undeveloped mineral sand mining ventures, at Xolobeni on the Wild Coast. Mineral Resources Commodities (MRC), a Perth-based company headed by Mark Victor Caruso, announced yesterday that it had taken a decision to divest its majority interest in the controversial dune-mining venture because of “ongoing violence and threats to the peace and harmony of the Xolobeni community” and hoped to sell its interests at Xolobeni to a local black economic empowerment group. The decision to sell has raised several eyebrows in the local community around who will fund the takeover, as well as the identity of the new beneficiaries if mining goes ahead. The announcement also coincides with a high-level meeting this morning at the Xolobeni Primary School between the local community and the deputy ministers of police, mining and water. It is understood the meeting has been requested by the Amadiba Crisis Committee to discuss continued violence and complaints against the police following the murder of Sikhosiphi “Bazooka” Radebe. Radebe, a taxi owner, community leader and chairman of the Amadiba Crisis Committee, was a vocal opponent of the dune-mining proposal. He was murdered in front of his son at his second home, in Bizana, in March, allegedly by two men in a stolen car posing as policemen. Four months later, though the stolen car was recovered, police have yet to announce any arrests for Radebe’s murder. Over the past few years there have also been numerous complaints about anti-mining community members being beaten up or intimidated by groups in favour of the mining plan. They include claims that a number of residents from the Amadiba/Xolobeni area were beaten up during the Christmas holidays by local men who had been given jobs at MRC’s Tormin mine in the Western Cape. There have been complaints that schoolchildren were sjambokked by police after voicing opposition to mining. In an announcement posted on the Australian Stock Exchange website yesterday, MRC said it had invested significant funds, technical and social resources in the Xolobeni proposal over the past 13 years. 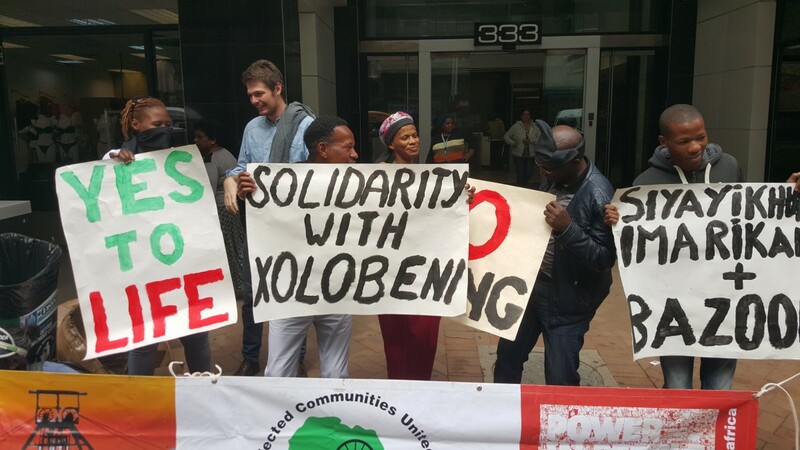 “The company has accepted that attempts to facilitate peaceful and safe site access by environmental consultants to assess the possible environmental impacts of the Xolobeni project continues to cause undue tensions and conflict, something that the company has openly tried to avoid. After “due consideration” the company had decided to divest itself of its interest in mining Xolobeni, subject to satisfactory commercial negotiations and agreement with its other shareholder. Accordingly the company and its South African subsidiary (MRC Resources Pty Ltd) had entered into a memorandum of agreement with its BEE partner (Keysha Investments 178 Pty Ltd) for the sale of its 56% interest in Transworld Energy and Resources, the company that owns the Xolobeni mining project. MRC said its decision to divest was “in no way a reflection of its (other) mining interests”. A company search done yesterday indicates that there are only two active directors of Keysha Investments 178 – Pretoria-based Corporate Law Services, and Cope election candidate Mzwandile Maxwell Maraqana, who is based in Lusikisiki. Corporate Law Services and Maraqana are also listed as active directors of the Xolobeni Empowerment Group, along with local chief Lunga Baleni, Khaliphile Baleni, Mary Baleni, Mavis Denge, Lucy Denge, Mziwakhe Dlamini, Zodwa Langazana, Christopher Ngcwele, Johnson Ngundze and Sizwe Shezi. In a separate company search late last year, Corporate Law Services was further listed as an active director of the MRC subsidiary company Blue Bantry Bay Investments 255, along with Port Elizabeth attorney Maxwell Boqwana, Xolobeni resident Zamile Madiba Qunya, Yolisa Ntanndokazi Capa and Daluxolo Mantlana. This article was published in the Mercury on 19 July, 2016.